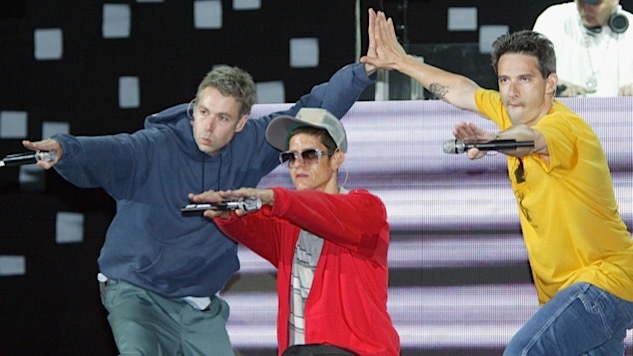 What with all of this “Fight For Your Right Revisited” hoo-ha, it appears as if the Beastie Boys are coming to terms with the full arc of their career. For the Beasties, their first mega-smash hit used to occupy the same cultural dead zone as the Star Wars Christmas Special: Yes, of course it existed, but you weren’t going to get them to admit it. But now, with an increasingly long lag time between albums and Adam “MCA” Yauch’s health issues throwing the group’s future into doubt, maybe it’s time to settle old scores. So, in honor of both the Boys hitting the quarter-century mark and this week’s release of Hot Sauce Committee, Pt. 2, Paste presents our 20 favorite Beastie Boys tunes of all time. Plus: 5 instrumentals! The limp To The 5 Boroughs was a big letdown when it came out. Well, except to Rolling Stone’s editors, who apparently appreciated all of the jabs at good ol’ Dubya. But “An Open Letter” works as a passionate aural collage and tribute to the Beasties’ hometown. Ostensibly, the song is a post-9/11 pep talk. But it’s more a portrait of the Big Apple as three men once knew it, and the ideals that the city still represents. Okay, enough serious crap. Here’s the Beasties doing that three-headed braggadocio thing we all love so much on this non-album track. Maybe it’s because MTV played them to death, but I have little love for the big singles on Licensed To Ill. It’s like listening to three junior high school boys grunt over bad hair metal. Give me this instead, any day: a hard, skeletal beat, with each Beastie jockeying to out-schlock the others. Because they have such beautiful chemistry collectively—and such interchangeable flows individually — there aren’t a lot of Beastie Boys songs like this one: each guy gets a verse all to himself. Adrock riles up the crowd, Mike D plays the easygoing philosopher, and MCA absolutely grinds rival MC Serch down to the cuticles. A live favorite. That harpsichord interlude is such a double-take moment for first-time listeners. A gem tossed off between two-on-two basketball games, “Get It Together” features a freestyling Q-Tip at the peak of his powers and the Beasties riding his verse’s coattails. These guys don’t do enough story songs. Who could top this cautionary tale of a scheming party girl? Does anyone else get a Public Enemy vibe from this beat? What a statement to open Check Your Head. And it became the namesake for an excellent NewsRadio character. The night of 1,000 steel drums! We easily could have packed another two or three Paul’s Boutique deep cuts onto this list, but this track wins for its sheer, spaced-out L.A. vibe.